Every dog owner should understand that their dog requires a sufficient amount of exercise for proper health and to be a good family member. A high percentage dogs with behavior issues are just not getting enough exercise. I have cared for dozens of dogs that transform into a totally different dog after 3-4 weeks of steady exercise. When you have to relocate and pet shipping is required, a healthy dog is always a much lower risk than one that does not get proper exercise. Over weight dogs and under-exercised dogs have more stress when being shipped. If you are getting ready for a move with your buddy, start a exercise routine asap if your dog doesn’t already have one. Walking your dog will lower your stress levels and has also shown to help prevent cardiovascular disease . Many people mistakenly believe that a small dog needs less exercise, and that is not the case. Different breeds have different energy levels, but you must look at the dog as an individual and assess his or her needs. Many small dogs who tend to bark all day will settle down quite a bit once they start getting regular walks. Larger dogs with behavior issues, can benefit even more. I remember one boxer that I kenneled named Champ. Champ was a bit of a nightmare. When he was shipped to me, he jumped all over guests, tugged at their pant legs and was just too much for most people to handle. 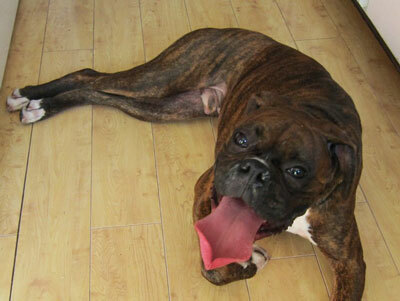 Boxers are notoriously playful and require quite a bit of exercise. It’s not their fault if they are not getting enough work and stimulation. That is the responsibility of the owner. I have a “flirt pole” that I built out of PVC pipe, a piece of rope and a red Kong at the end of the rope. After a week of exhausting Champ with regular walks and daily flirt pole sessions, he was a very different dog. Still rambunctious like any young boxer, but way more relaxed and enjoyable to be around. If you have never seen a flirt pole, just google “dog flirt pole”. They are easy to make, or you can buy one ready to go, and they trigger almost any dogs prey drive. The dog will chase the toy at the end of the rope all day or until the dog tuckers out. Some dogs will chase any toy, some prefer something with a furry tail. Just see what works, you will be glad you did. Here is a flirt pole in action. As your dog’s master or pack leader, you need to help the dog burn off all of that energy. A walk every day with your dog should be mandatory. No dog should be sitting in a back yard alone all day. Many dogs may require more stimulation or work, like running, catching a frisbee, or swimming, or chasing the toy at the end of a flirt pole in addition to a daily dog walk. Get a regular walk routine going with your dog and the bond will grow deeper. It will also prepare the dog for any travel situations that come up. Pet shipping is no problem for a calm and healthy dog.